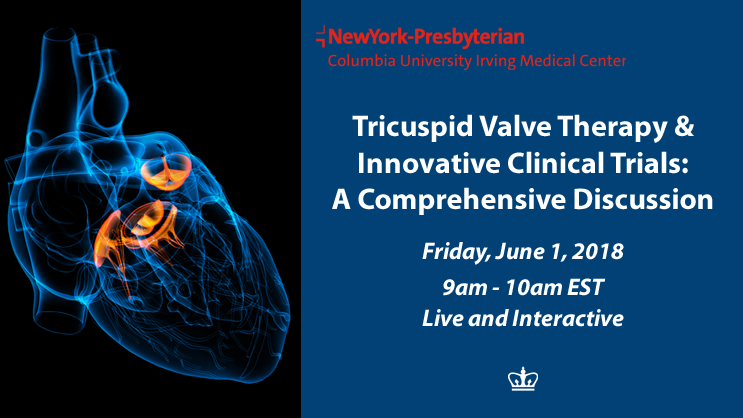 “Tricuspid Valve Therapy & Innovative Clinical Trials: A Comprehensive Discussion” is designed to educate clinicians on the therapy options available to those with tricuspid valve disease.The course directors are; Drs. Vinayak Bapat, Rebecca Hahn and Susheel Kodali. The faculty have put together a comprehensive agenda, which will explore the current standard of care as well as newer technologies being examined and explored. Topics such as diagnostic dilemmas, treatment guidelines, challenging cases, innovative interventional options and current clinical trials will be covered. Attendee participation and interaction will be facilitated through Q&A. Cardiovascular experts are currently working in an era of renewed interest and enthusiasm surrounding the diagnosis and treatment of valvular heart disease. This is partially driven by emerging percutaneous therapies for the treatment of aortic, and mitral valve disease. However, despite this fury of investigation, little or no attention has been given to the treatment of tricuspid valve disease until recently. Tricuspid regurgitation (TR) occurs mainly from tricuspid annular dilation, which can result from left-sided heart failure from myocardial or valvular causes, right ventricular volume and pressure overload, or dilation of cardiac chambers. When symptoms develop despite medical therapy and/or the heart valve disease progresses an intervention is normally required. The most common treatment for pulmonic tricuspid valve disease is a surgical replacement or repair however the clinical outcomes for surgery have traditionally been poor. Newer, less invasive therapeutic options are being explored with promising outcomes. This program will cover the spectrum of care currently available or soon to be available to patients with tricuspid valve disease.